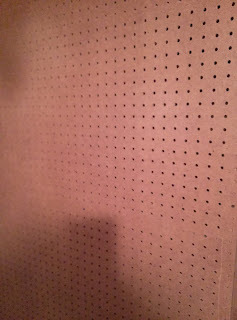 I started off with some extra pegboard I had in the basement. 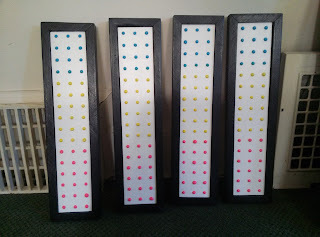 Traditionally the candy had three vertically running rows of dots on a narrow strip of paper. So, I ripped strips from the panel three rows wide with a table saw and chopped them at the length you find the strips sold in stores today as a "throwback" item (seventeen rows long) with a compound miter saw. I made some shorter ones too as you'll see. Back in the day, you'd find this candy on a dispenser at the end of a dime-store checkout counter, peel off the desired amount and pay by the length. 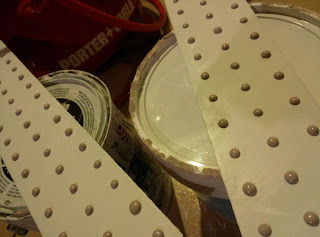 I sanded the surface to get that shiny coating off (a 100 or 120 grit paper will do) and put a few coats of white acrylic paint on them. 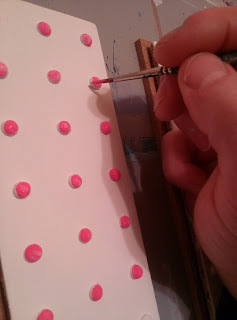 Painting in somewhat of a crosshatch fashion I was able to duplicate the fibrous nature of the wax/parchment paper the candies are stuck to. 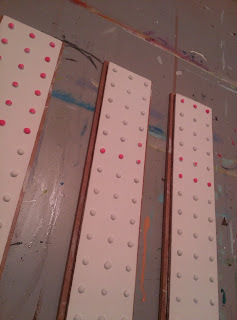 I then sprayed a coat of "non-yellowing" clear matte acrylic onto the boards to seal the paint. This way, if something goes wrong in future steps, the finish will come off but not the paint itself. Pegboard comes in white if you want to skip this whole step but it won't look as authentic. The next step was the messiest and most involved. I tried many different ways but none gave me the results this method did. Bondo® body filler. It's typically used for fixing blemishes on car bodies and can be sanded after hardening. This allows you to control the surface shape and texture at different stages of the game. Mix that stuff up according to the directions. You don't have much time mind you. I put some exam gloves on for protection and proceeded to push little wads of the putty through the holes from underneath, one by one, making sure each was similar in size and shape until they were all filled. Good luck! After letting those dry overnight, I went ahead and glued some hardboard to the backs of the strips with some Gorilla® glue. The pieces of paneling I cut were slightly larger than the candy strips leaving a 1/4" margin around the perimeter. 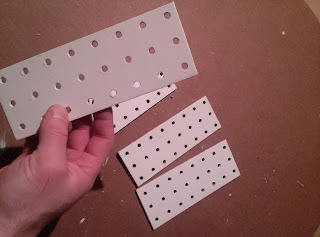 This allows the frame you make to latch onto that lip instead of the candy panel. It also gives you something to hold onto during the steps leading up to framing! Be sure to follow the directions that come with the glue. You'll also want to inspect each of the Bondo® mounds at this point and sand smooth any imperfections with some 320 grit wetordry paper. This step is important or the colors won't have that pop to them. Paint all the Bondo® mounds white and touch up any areas where the Bondo® or glue tarnished the white background. Now, the fun part. 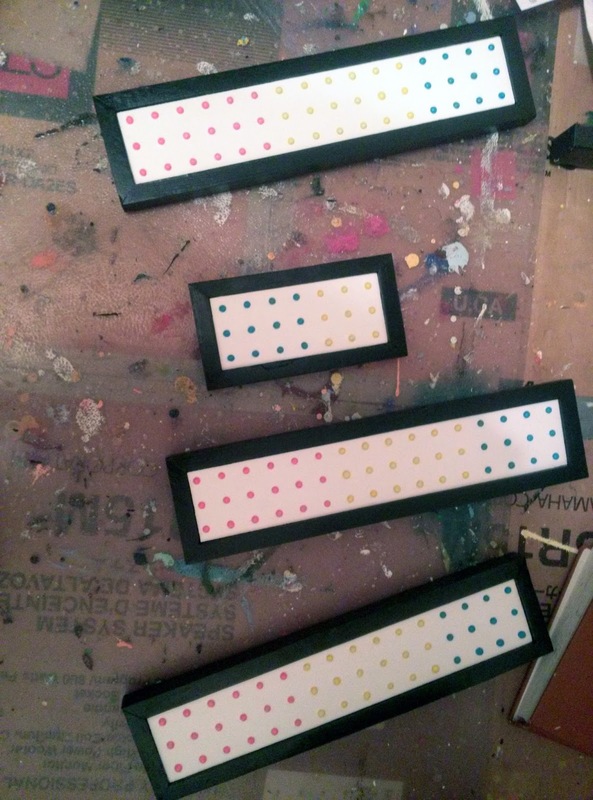 Make sure you have the "real" candy on hand so you can get the colors matched up correctly. You'll sometimes see it at your local big box chain or specialty store, if not, just do a web search and order online. The trick here is to fool your eyes into thinking it's "close enough" to the real thing. Your brain will do the rest. Mix up your colors before you start. You'll want one small container of each color to have on hand to work with and the ability to seal them up for later painting sessions. 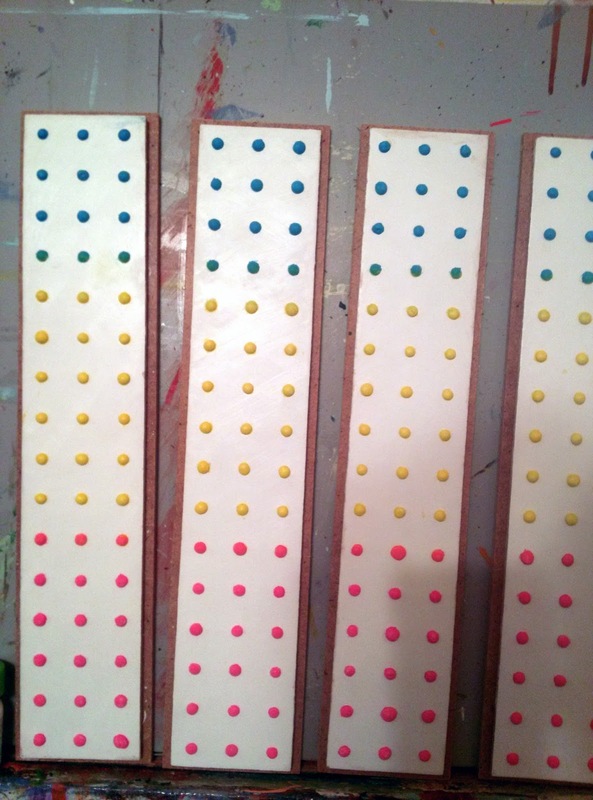 Once you have those colors dialed in, the last thing you want to do is more color matching. Start painting! Work your way through the color groups. Acrylics are pretty quick to dry but sometimes not as quick as you'd like. So, start where the colors change and work back from it. If you do the same for the next color group, by the time you're done, the previous group you did will be dry. This reduces the likelihood of smudges and therefore...REWORK! 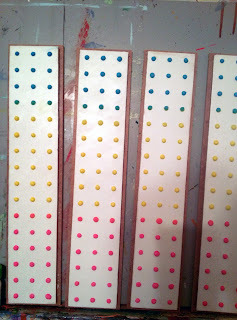 Continue on with all three colors. Keep in mind the transitions. If you look closely, there's a point where the colors bleed into each other a bit. Make sure you duplicate that effect if you want it to look real. 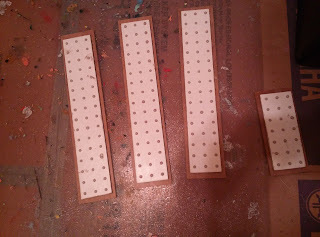 It takes about 3 coats to get these things looking right plus touch ups along the way. 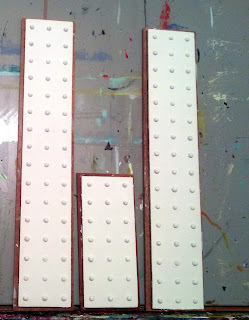 Make sure you cover up any colors that got onto the "paper" area with more white paint. The continuity won't be there otherwise. Once you're satisfied with how they look, grab yourself a spray can of clear matte acrylic finish. Make sure it's "non-yellowing." Give the whole thing a nice even coating. This will not only protect your hard work but give it that waxy look that the candy naturally has too. 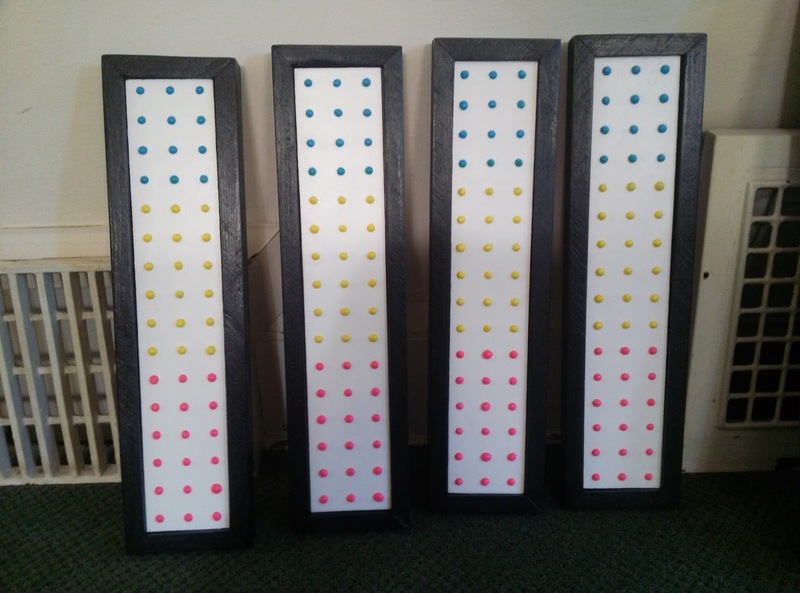 Now you're ready to frame them up and put hanging hardware on the back if you want. You'll need a table saw and that compound miter saw again for this step. 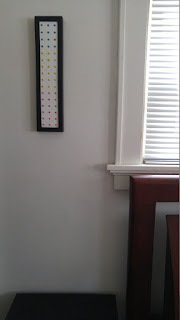 I used a brad nailer to pin the corners too. Sorry, framing isn't a part of this "how-to." I painted the frames black for a pop art look but that's up to you. There you have it. Hang it up! ...now if that seems like way too much work and you'd rather just purchase one, check out the (E)store to see what's left. I made 12 pieces altogether. For as fun as it was making them, I won't be making more.